Complete Distributor Ignition Tune up kit. W/ Engine Oil Filter, Fuel bowl & Carb kit. JOHN DEERE 1010 & 2010 TRACTOR. W/ DELCO CLIP HELD DISTRIBUTOR. Some listed models may use more than one type. VERIFY YOUR MODEL HAS THE DELCO CLIP HELD DISTRIBUTOR. Does not fit Delco Screw Held, nor Autolite / Prestolite Distributor. Distributor Cap, Dust Cover, Ignition kit (points, condenser, rotor). Universal Spark plug wires, 4 Autolite 216 Spark Plugs. 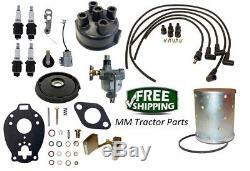 Fuel Bowl, Engine Oil Filter (Cartridge Style), & Carburetor Kit with Float. 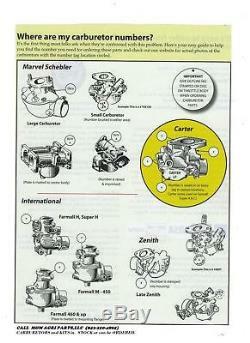 Carburetor kit is for Marvel Schebler Carburetor. TSX13, TSX28, TSX33, TSX34, TSX42, TSX43, TSX45, TSX49, TSX55, TSX60, TSX74, TSX85, TSX88, TSX89, TSX90, TSX91, TSX112, TSX114, TSX120, TSX134, TSX138, TSX151, TSX154, TSX155, TSX156, TSX157, TSX159, TSX186, TSX188, TSX212, TSX237, TSX241A, TSX241B, TSX241C, TSX248, TSX253, TSX264, TSX272, TSX305, TSX308, TSX309, TSX312, TSX319, TSX330, TSX356, TSX361A, TSX363, TSX380, TSX403, TSX405, TSX406, TSX418, TSX420, TSX421, TSX422, TSX428, TSX458, TSX470, TSX480, TSX486, TSX500, TSX514, TSX520, TSX531, TSX541, TSX551, TSX577, TSX580, TSX593, TSX597, TSX603, TSX605, TSX635, TSX650, TSX653, TSX663, TSX665, TSX670, TSX680, TSX683, TSX690, TSX692, TSX694, TSX696, TSX701, TSX706, TSX714, TSX730, TSX744, TSX748, TSX765, TSX771, TSX804, TSX809, TSX815, TSX827, TSXU834, TSX844, TSX860, TSX864, TSX879, TSX882, TSX896, TSX896SL, TSX912, TSX926, TSX931, TSX936, TSX936SL, TSX937, TSX937SL, TSX948, TSX949, TSX957SL, TSX976, TSXU832. SIGN UP FOR OUR NEWSLETTER. We carry NEW, QUALITY parts. Our parts fit the tractors and application as stated in the listing. We cannot be responsible for any alterations that may have been made to your tractor. For example: if someone has put a different engine in your tractor, changed the decals, or. Used an incorrect part prior to you ordering the correct part. We guarantee our parts, however, we cannot guarantee that purchasing this part will repair your specific problem. If youre un-sure of your mechanical skills, please have a qualified repair shop / mechanic perform the installation (repair) with this part. The item "John Deere 1010 2010 Tractor Distributor Tune up, Carburetor kit, Oil Filter +" is in sale since Sunday, January 14, 2018. This item is in the category "Business & Industrial\Heavy Equipment, Parts & Attachments\Heavy Equipment Parts & Accessories\Tractor Parts". The seller is "mmtractorparts" and is located in Hartsville, South Carolina. This item can be shipped worldwide.